During bilateral meetings on maritime safety, China asked the US to phase out surveillance activity using Low-Frequency Active Sonar near its coast. 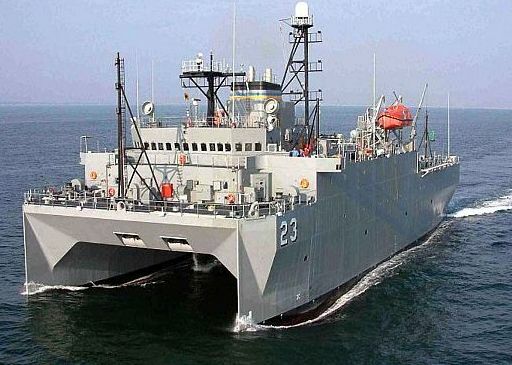 Over the past year, there have been five incidents in which Chinese ships (Naval and fishing boats) harassed the USNS Impeccable, one of two US ships equipped with LFAS, and other Navy ships. The Chinese object to surveillance activity within its EEZ (Exclusive Economic Zone), which extends 200 miles from each country’s coast; the US contends that such activity is only barred within the 12-mile territorial waters zone. Navy survey ships were harassed five times this year by Chinese naval and civilian vessels as well as military aircraft in the South China Sea and Yellow Sea – in one case 75 miles south of Hainan island, the location of a strategic Chinese Navy base which reportedly houses ballistic missile submarines. Beijing said at the time that the unarmed Impeccable, was carrying out “illegal surveying” in its EEZ, violating Chinese and international laws. The U.S. Navy says the Impeccable is designed to detect quiet foreign diesel and nuclear-powered submarines and to map the seabed for future antisubmarine warfare purposes. A Canadian court has declined to issue a stay to prevent the vents survey from continuing. The ship has reached the research area, and has begun the planned project, which involves laying bottom-mounted receivers and doing ten days of airgun shots. In the course of the short legal brouhaha, it came out that the Canadian Department of Foreign Affairs had essentially lost Columbia University’s application for Foreign Ship clearance from February until mid-July, thus contributing to the lack of time for all concerned parties to respond to the plans prior to these hectic pre-cruise days. An amended permit application from Columbia, submitted the day after the initial lawsuit was filed, was accepted by the Canadian Department of Fisheries and Oceans; it aims to avoid exposing any whales to more than 160dB of sound, which creates an effective “exclusion zone” of nearly 7km (which should easily protect the critically endangered North Pacific right whales that EcoJustice mentioned in a TV interview, as they summer in Alaskan waters). The 7km exclusion zone is rather shocking, as only last May I participated in a DFO seismic mitigation expert committee meeting at which the oil and gas industry and agency staff were fully content with 500m exclusion zones, except in especially rich and sensitive whale habitat, where the most extensive exclusion zones were, as I recall, 2.5km. What sorts of magical powers will be employed by Marine Mammal Observers aboard the Langseth to effectively observe at this super-human distance, was not detailed by the DFO. In any case, the relative lack of whales in this region this time of year should mean that disruption is minimal, though some may well hear and avoid the survey; various species seem to avoid seismic sounds at different distances, from a kilometer or two for most species to 20-30km for belugas and bowhead whales (neither of which occur in this region). Read the earlier AEInews post covering this incident here. Recent news reports can be read here and here. Offshore Wind Farms May Be Heard Many Miles Away? As AEI has tracked noise complaints around wind farms on land, which seem fairly common between a half mile and mile (and in some cases up to a mile and half or so), I’ve held on to the idea that offshore will be the better way to go. Offshore wind developers have been mostly aiming for siting turbines far enough offshore to minimize visual impacts (2 or more miles), which I had assumed would also make them inaudible from shore. But recent reports are throwing some doubts on that hopeful thought. We need to hear more from other locations, but a wind farm that began operating on Wolfe Island, Ontario, this summer has surprised local observers with its long-range sound transmission. Wolfe Island is at the eastern end of Lake Ontario, at the mouth of the St. Lawrence Seaway. Even ship operators have noticed turbine noise at 2-3 miles distant (and ships are not exactly a quiet place to listen from), and locals across the channel in Cape Vincent, NY have also been hearing the wind farm readily at 2-3 miles, and, in some atmospheric conditions, as far away as 7 miles! Yikes…. The reasons for the easy long-range sound transmission are not yet known, though sound does travel well across water, so that may be a key feature. If so, it ups the ante on offshore wind farms, at least when prevailing winds are toward shore. (Though we must note that this is not along the coast, but rather at the end of a huge lake which fosters strong prevailing winds.) This one is not yet a clear red flag, but it bears watching…. 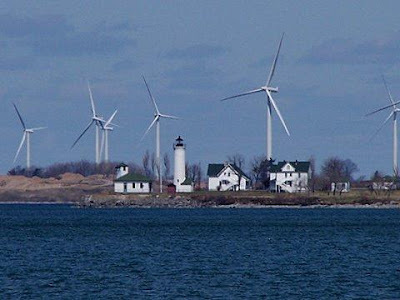 And, on a brighter note, the health of Wolfe Island residents is being charted by Queen’s University researchers, in the first research study to assess health before and after wind farm operations begin in a community. This is an important next step in clarifying whether the health effects that have previously been reported are widespread, or rare. Like many others, I’m a little late to this party: in June, the Obama administration kick-started a rapid process of developing a coherent ocean policy. An “Ocean Policy Task Force” has been charged with making recommendations to the administration in two phases: by mid-September, they are expected to offer a framework for ocean policy as well as a “an implementation strategy that identifies and prioritizes a set of objectives the United States should pursue to meet the objectives of a national policy for the oceans, our coasts, and the Great Lakes.” Then, by mid-December, the Task Force is asked to recommended a “framework for effective coastal and marine spatial planning. This framework should be a comprehensive, integrated, ecosystem-based approach that addresses conservation, economic activity, user conflict, and sustainable use” of the oceans and Great Lakes. Public comments are being welcomed here. UPDATE (8/27): A Canadian court has declined to issue a stay to prevent the vents survey from continuing. The ship is en route to the area, and will continue with the planned research project; the first step will be laying bottom-mounted receivers, before commencing ten days of seismic airgun operations during September. In the course of the short legal brouhaha, it came out that the Canadian Department of Foreign Affairs had essentially lost Columbia University’s application for Foreign Ship clearance from February until mid-July, thus contributing to the lack of time for all concerned parties to respond to the plans prior to these hectic pre-cruise days. An amended permit application from Columbia, submitted the day after the initial lawsuit was filed, was accepted by the Canadian Department of Fisheries and Oceans; it aims to avoid exposing any whales to more than 160dB of sound, which creates an effective “exclusion zone” of nearly 7km. This seems quite surprising, as only last May I participated in a DFO seismic mitigation expert committee meeting at which the oil and gas industry and agency staff seemed fully content with 500m exclusion zones, except in especially rich and sensitive whale habitat, where the most extensive exclusion zones were, as I recall, 2.5km. What sorts of magical powers will be employed Marine Mammal Observers aboard the Langseth to effectively observe at this super-human distance, was not detailed by the DFO. In any case, the relative lack of whales in this region this time of year should assure that few if any whales are close enough to be harmed, though some may well hear and avoid it; various species seem to avoid seismic sounds at different distances, from a km or so for some species to 30km for belugas and bowhead whales (neither of which occur in this region). Recent news reports can be read here and here. A month-long seismic survey long scheduled to begin this week has been temporarily sidelined by a Canadian court challenge mounted by BC-based EcoJustice. While the Acoustic Ecology Institute has been closely monitoring the effects of seismic surveys for several years, and I do indeed have concerns about the degree to which airgun noise may disrupt foraging in some cetaceans, this particular lawsuit appears to me to be a dramatic over-reaction to what is planned. Throwing up legal roadblocks to a carefully designed, ten-day academic study is a very extreme reaction, and should be reserved for times and places where there is real danger of harm. But for this survey, the risks are truly negligible—and this is spoken by someone who resents the free use of “negligible impact” in EAs that minimize the effects of chronic behavioral disruption of cetaceans by noise. The survey, to be run by Columbia University’s Lamont-Doherty Earth Observatory and researchers from the University of Oregon, aims to study the geology underlying a deep benthic vent community 250 km offshore from Vancouver Island, as well as the larger tectonic plate structure in this earthquake-prone region. The lawsuit seeks a restraining order, contending that Canada’s Minister of Foreign Affairs cannot grant clearance to a foreign vessel that is expected to harass marine mammals in violation of Canadian law. “To ensure compliance with environmental laws, Canada should deny clearance to this vessel and refuse to sanction the harassment of endangered whales” say Lara Tessaro, Ecojustice lawyer. (I can’t speak to EcoJustice’s point re: Canadian regulatory process, but the whale threat is being wildly overblown; see below) The R.V. Langseth would be outfitted with 36 airguns, which fire together to create a loud impulse sound, with its echoes from deep beneath the seafloor to be recorded by bottom-mounted receivers deployed from 4-10km apart. The researchers completed an Environmental Assessment and received permits from NMFS, in accordance with US law governing research funded by the US National Science Foundation (see EA with project summary and projected whale encounters). Cliff Feigenbaum just pointed me toward a corporate consulting business has been up and running since 2004 in the UK: The Sound Agency will help any corporation or small business to tune into the sonic messages that their brand and daily operations are engaged in, and to fine-tune their sonic image. 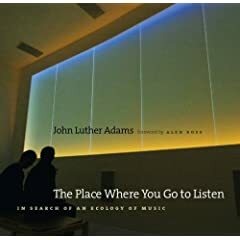 They’ve got some top-flight sound artists working with them, too: ambient/electronic wiz David Toop and Harmonic Choir founder David Hykes for starters, along with sound healing expert Joshua Leeds, and, perhaps for more of an edge, Barry Adamson, late of Magazine and Nick Cave and the Bad Seeds. Their work ranges from assessing the company’s phone, office, and advertising sound choices, to creating a “sonic logo.” One of their featured products is generative soundscapes for use in offices and phone lines; these sound loops are layered with several tracks that create never-repeating mood music tuned to the place they are being used, or to “brand voice” of the company. Founder Julian Treasure, himself a drummer in several post-punk bands in the 70s and 80s, wrote the book Sound Business in 2007. With one of the nation’s “poster child” noisy wind farms in Mars Hill and a popular former governor advocating (and financing) more use of wind power, the State of Maine continues to be at the forefront of the debate over how much credence to give to neighbors’ reports and concerns about wind turbines close to their homes. Seventeen neighbors of the Mars Hill wind farm, who live from under 2000 feet out to 3600 feet from active turbines, have filed suit against the wind farm developer, asking for compensation for loss of property values, nuisance and emotional distress, and upgrades to the turbines to make them quieter (download the full complaint). The Todd Residence in Mars Hill. Photo by Anne Ravana. This case is one of the first that has revolved around what appears to be a common threshold for noise issues with wind farms, the half mile to mile range. Though setbacks of a mile or more may still be warranted if the goal is to avoid noise problems altogether, very few serious noise complaints have arisen from wind farms that are three-quarters of a mile or more from homes. Thus the Millers request, while coming too late for serious consideration, was very reasonable. A recent report from the UK highlights another perspective on this half-mile issue: the Westmills Wind Farm consists of four turbines, all within a half mile of the village of Watchfield. However, the project brought 2400 locals into a cooperative which owns 100% of the farm. This is an example of a growing trend in the UK, by which communities buy into wind farm projects. In these cases, it may well be that occasional noise issues are more easily accepted, in contrast to projects in which the noise is foisted upon unwilling neighbors. An important note is that (as usual), news reports on both of these cases neglected to clarify whether the homes a half mile away were upwind or downwind of the wind farm sites, which can make a huge difference as to whether noise issues are likely to crop up. It’s deja vu all over again over again over again, as Secretary of Interior Ken Salazar stepped up as the third Administration to attempt the now seemingly absurd task of setting permanent rules governing the use of snowmobiles in Yellowstone National Park. Both the Clinton and Bush plans ended up with dueling Federal District Court rulings in Wyoming (where relatively snowmobile-friendly decisions tend to result), and DC (where results tend to hew more toward the analysis done by the Park Service, recommending limits). This time, it took only one day for the State of Wyoming to dash into Judge Clarence Brimmer’s District Court and urge the new plan to be set aside. The Obama administration has proposed a temporary rule for snowmobile management over the coming two winters, while yet another Environmental Impact Statement is developed. Their proposal matches the recommendation made in the Park Service’s last EIS, to allow 318 snowmobiles a day into the Park. The Bush administration had ignored this recommendation, and in November 2008 instead proposed a rule allowing 540 per day; the DC court said that the choice was not sufficiently backed up by the EIS, and ordered the Park to come up with a new plan. When the Park proposed the 318 number for last winter, the Wyoming court issued a ruling that spurred differing interpretations; the Park Service (likely sensing the likelihood of a judicial logjam blocking the entire snowmobile season), decided that the Wyoming ruling mandated them to revert to an expired 2004 Final Rule that allowed 720 machines, though environmental organizations held that the Judge had made no such firm requirement. In any case, Wyoming is now aiming to clarify that ruling, by asking Judge Brimmer to affirm their interpretation that his 2008 ruling requires the Park Service to revert to the 2004 rule until a new EIS is completed. As usual, local news outlets like the Jackson Hole Daily have some of the most thorough coverage. A recent article in the UK newspaper The Independent has triggered an avalanche of commentary in the press and blogosphere about the possible health effects of living near wind farms; more is sure to come when Nina Pierpont’s Wind Turbine Syndrome book is finally published this fall. In the book, Pierpont posits a set of symptoms that can crop up in people exposed to wind turbine noise; she suspects that low frequency noise is the key factor, and that people with vestibular system imbalances may be especially prone to problems. UPDATE: The wind industry in the UK responded vehemently to the article, which was reprinted in several cities. During the 2004 RIMPAC multinational navy exercises in Hawaii, a pod of over 150 melon-headed whales appeared in a shallow bay, far from their normal offshore habitat. Their agitation was obvious, and one young whale beached and died. When it became apparent that sonar training was taking place offshore that day, the Navy initially said that the transmissions did not begin until later in the day, but later confirmed that some early-morning calibration of the sonar took place. A NOAA investigation determined that sonar was the “likely, if not probable” cause for the stranding; this statement was clarified later by NMFS, to affirm that they were not sure of the link. On the same day, another pod of melon-headed whales had appeared in a shallow bay on the western Pacific island of Rota, spurring speculation that the full moon may trigger this species to undertake feeding excursions into shallow bays, with the Hawaii pod subsequently getting disoriented and panicked (perhaps due to the sonar sounds offshore). The similarity of the incidents led many observers (including AEI) to be less sure that the Hanalei event could be tied primarily to a reaction to Navy sonar. A report commissioned by the International Fund for Animal Welfare (IFAW), and submitted in July to the International Maritime Organization’s Marine Environmental Protection Committee, provides a detailed assessment of the prospects for using ship-quieting technologies to reduce the level of background noise in the world’s oceans. According to the report, which cites a wide array of recent research, similar types of ships can vary in their sound emissions by 30-40dB; some engineering experts suggest that the noisiest of these could reduce the primary source of noise (propellor cavitation) by 10dB. The report, Reducing Underwater Noise Pollution from Large Commercial Vessels, by Dr. Marin Retilson, is available for download on the IFAW website. “The noisiest 10% of ships account for between 50% and 90% of the noise pollution and it is these vessels that are most likely to benefit from relatively minor modifications to reduce propeller noise,” said Russell Leaper, an IFAW scientist. The report summarizes technical approaches to reducing ship noise, with an emphasis on utilizing modern propeller design, along with fins and ducts to improve wake flow, which could reduce noise output from the noisiest ships and be cost effective. There is a relatively poor understanding of noise output from large commercial vessels and the next step is to do more wide-reaching assessments of individual ship noise, in order to identify the vessels that could make the most difference in reducing ocean noise levels. A target of a 3dB reduction (i.e. halving the acoustic energy) in 10 years in ocean noise was suggested at an International Workshop on Shipping Noise and Marine Mammals held in Hamburg in April 2008. This target has been endorsed by the Scientific Committee of the International Whaling Commission. You can download the Hamburg workshop report here. The World Wildlife Fund is working to build public pressure to force Exxon-Mobil to suspend development activities near the critically important summer feeding grounds of the dwindling Western gray whale near the Sakhalin oil and gas fields on Russia’s north Pacific coast. This spring, other energy companies took to heart the advice of a special science advisory panel to suspend seismic surveys during this year’s grey whale season (July-October), but Exxon continues its activities, which apparently are centered on construction more than exploration at this point. According to the Sakhalin consortium, noise monitoring takes place via buoys along the edge of the feeding grounds, and activities are suspended when whales are too close. However, the continued decline of this distinct population (now down to 130, with just 25 breeding females), along with apparent avoidance of the area in past years as noted by the science committee, has spurred calls for extreme caution about any noise-making during the feeding season. After suspending the use of mid-frequency active sonar training activities in Puget Sound in the wake of an incident in 2003 in which sonar sounds appeared to agitate a group of orcas, the Navy confirmed this week that a new sonar training plan, with permits to be issued by the National Marine Fisheries Service, will keep future sonar training off the West Coast, and out of inland waterways. Chris Dunagan at the local Kitsap Sun gives the announcement his usual thorough coverage, including context from the past, as well as zeroing in on a key passage in the Navy’s public statement: “Any use of high- or mid-frequency active sonar for training purposes in Puget Sound would be beyond the scope of this permit,” the statement says. “However, outside of this permit, active sonar is used within Puget Sound for safety and navigation; testing; maintenance; and research, development, test and evaluation (RDT&E).” An incident in January of this year, during which mid-frequency active sonar was heard through a night, was part of RDT&E activities. Dunagan explores the question of these multiple activities a bit more in an accompanying blog post. The Minnesota Public Utilities Commission has initiated a formal investigation of wind turbine setback requirements, after numerous complaints about noise. Minnesota Public Radio has a long piece on the process (both audio and a transcript), and a local regulatory advocate points us to the right documents on the PUC website for more information. A recently-released report by Dr. Christopher Hanning, a UK MD whose specialty is sleep disorders, takes a comprehensive look at factors affecting sleep disturbance caused by nearby wind farms, and is highly recommended reading for anyone working to develop regulations at the local or state level. Hanning’s primary point is that external noise need not WAKE a sleeper to cause problems, and the repeated “arousals” can break the most restful periods of sleep. He notes that “The sleep, because it is broken, is unrefreshing, resulting in sleepiness, fatigue, headaches and poor memory and concentration.” These are precisely the symptoms often reported by people living near wind farms. He stresses that arousals are also associated with “physiological changes, an increase in heart rate and blood pressure, which are thought to be responsible for the increase in cardiovascular risk. Arousals occur naturally during sleep and increase with age (Boselli 1998) which may make the elderly more vulnerable to wind turbine noise. Arousals may be caused by sound events as low as 32 dBA and awakenings with events of 42dBA (Muzet and Miedema 2005), well within the measured noise levels of current wind farms” and the levels permitted by most jurisdictions. Thanks to Lynda Barry at National Wind Watch for the heads up. Death Valley has become the sixth National Park to initiate a formal Air Tour Management Plan process since the 2000 passage of legislation mandating such plans in National Parks with commercial helicopter or plane overflights. It’s the first new plan to begin since 2004, when similar planning began at Lake Mead, Mt. Rushmore, and Badlands National Park, and two Hawaii national parks. The process, under the auspices of the Federal Aviation Administration (FAA) has been shockingly slow; initial scoping (information gathering) for Environmental Assessments or EISs took place in 2004 and 2006 in these parks, but there have yet to be any draft EISs released. Air tour management began at the Grand Canyon well before the 2000 legislation, and continues to move slowly toward final resolution. At Death Valley, existing helicopter tours operators are hoping that the new process will not limit their activities, which have so far seemed to not cause significant visitor conflicts. Death Valley also is home to a small airport at which up to 30 private planes land each day, mostly day trippers from Las Vegas or southern California. The decision to proceed with an ATMP was made at a late June meeting of the National Parks Overflight Advisory Group (NPOAG) Aviation Rulemaking Committee (ARC). The ARC is hoping to expedite the process at Death Valley by having all stakeholders more directly involved from the beginning, in hopes of demonstrating a process that can complete ATMPs in a more timely fashion at other parks in the future. Full minutes of that meeting are available here. UPDATE 3/25/10: The Senate has passed legislation allowing the NPS to ban helicopter tours at Crater Lake without going through a lengthy inter-agency process with the FAA. The measure still needs to be approved by a House-Senate conference committee. A request from an air tour operator to begin helicopter flights in Crater Lake National Park has stirred considerable local opposition. The Oregonian editorialized against the proposal, saying that the rim road already provides suitable access to those who can’t hike far. The same rim road is used by Leading Edge Aviation in its pitch to allow the flights, as they claim that their ‘copters will not cause any more noise impact than RVs in the summer or snowmobiles in the winter cruising the rim. Others are skeptical that the choppers are really that quiet. Erik Fernandez, wilderness coordinator for Oregon Wild, says, “It’s embarrassing enough that we have only one national park and so little protected wilderness in Oregon. Desecrating the experience at Crater Lake with helicopters buzzing around would be tragic.” Planned air tours range include a half-hour flight that just passes by the north rim and two longer options that skirt other Park landmarks, including Grouse Hill and The Pinnacles. See local press coverage here, and Leading Edge’s tour proposal here.